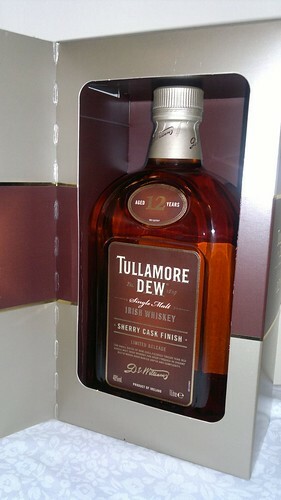 There is a new Tullamore Dew in the wild. If you want to track it down, it's exclusively in Heinemann airport duty free shops (in Germany, Austria, Norway, Hungary and Slovakia). It's not your typical Tullamore Dew, which is a blend of pot still, malt and grain whiskeys. This is a 12 year old single malt, made at Bushmills distillery. The final 6 months of maturation were spent in second-fill sherry butts in a Tullamore Dew warehouse in Clonmel. I haven't tried it myself but it turned up at a tasting of 12 year old Irish whiskeys at a recent Irish Whiskey Society meeting. It seems to have polarized the room: a few really liked it, most really didn't. I like that they are experimenting, at least. I hope they come up with one bottling, no matter how limited, that has a little something special with wide appeal. Just so the brand gets a look in when we are talking about favourite whiskeys. Tullamore Dew is a very successful brand, of course, and I'd happily order one over ice in a pub. But there isn't a great whiskey just for savouring in the line-up. (I'd have adopted the Black 43 as my "house blend" if it hadn't been discontinued). There is a chance to do something special for a "distillery bottling" that will only be sold at the visitor centre just opened in Tullamore. Perhaps they have already have something interesting maturing in that Clonmel warehouse.